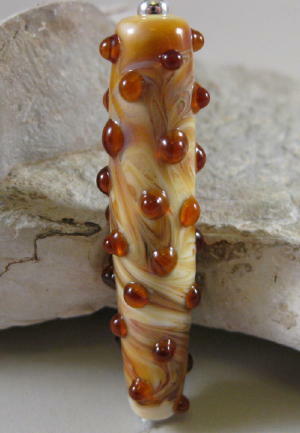 Soft Caramel colors swirled around in this yummy looking focal bead with raised amber bumps. Bead measures just under 57mm in length and is approximately 12mm at it's widest point. Bead is torpedo shaped and was wound on a 3/32 mandrel. 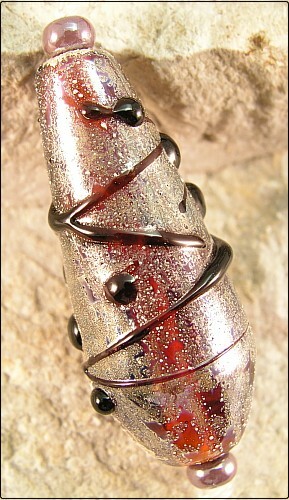 I love this smokey topaz colored glass! This bead is that lovely Czech smokey topaz with pretty pink roses, green vines and leaves with some baby's breath in between. Torpedo shaped bead measures 55.45mm in length and 13.48mm at it's widest and wound on a 3/32 mandrel. Amber and silver leaf with black threads in this teardrop shaped focal. Bead measures approximately 33mm in length. Pretty aqua teal colored focal bead with silver plum vines and leaves. Bead measures approximately 37mm in length. 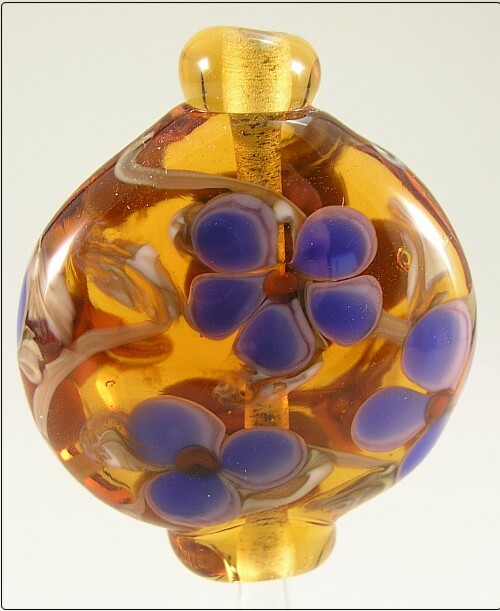 Pretty amber transparent focal bead with blue flowers and green vines. I put a lip wrap on each end. It reminds me of chinese lanterns. This bead is somewhat lentil shaped and measures almost 38mm from hole to hole and 31mm across at its widest.